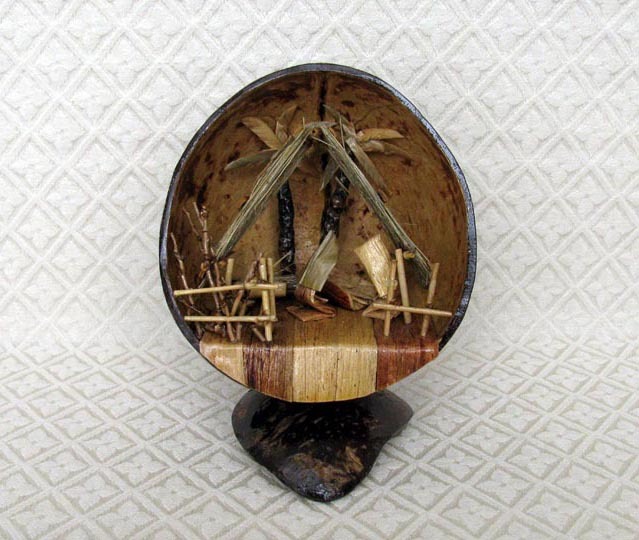 This Nativity is made from natural materials set inside a polished coconut shell. A quarter of a coconut shell is attached to the bottom of the coconut as a base. The Nativity scene inside the coconut depicts Joseph and Mary kneeling on either side of baby Jesus in His manger. The family is protected by a stable and palm trees. The stable roof is made from delicate straw while the fence around the family is made from varnished twigs. The scene measures 6 inches high. The Nativity was made by A Pich, a young man living with his family in Phnom Penh, Cambodia. Pich was born in 1999 in a countryside village called Svay Reang. His grandfather has been teaching him wood carving ever since he was old enough to hold a knife. In 2014 Pich helped his grandfather make coconut Nativities for a special order, then he continued to make them on his own. He hopes to own his own workshop someday.